Spoiler Alert: Regardless of your blood alcohol content, an arrest for DUI can be made in a Georgia DUI, if the officer is of the opinion that he or she has gathered sufficient evidence of “probable cause” to arrest. This type of evidence usually comes from a drinking driver talking, answering the officer’s questions, and trying to “talk their way out of a DUI arrest,” and attempting to pass the VOLUNTARY and OPTIONAL field sobriety tests. 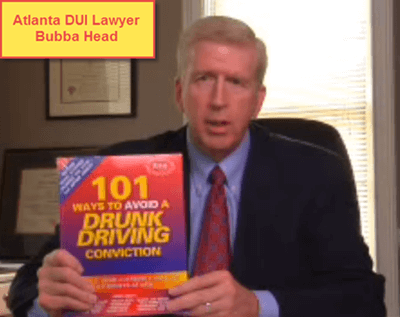 Read Mr. Head’s “11 Ways to Beat a DUI” to learn all the rules for not putting a DUI conviction on your permanent criminal record. 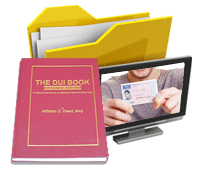 For more about DUI penalties in GA, click here. Police officers are not required to give you Miranda rights when they first begin to investigate a possible drunk driving case. Moreover, you can refuse every type of roadside test and the breathalyzer and STILL be arrested for DUI GA. A person with a DUI refusal will trigger an implied consent law violation, and possibly lose the right to drive in Georgia for a full year. Knowing what to DO and to NOT DO, is part of what Mr. Head focuses upon, in his Georgia DUI law website. See his 9 Tips for Avoiding a DUI conviction. What Is the BAC Limit in Georgia? In all states, the adult (drivers age 21 and over) the BAC limit is a 0.08 grams percent. This assumes that he or she is not operating a school bus or other CMV (commercial motor vehicle) in Georgia, because these drivers of high risk vehicles are held to a much stricter BAC level of 0.04 grams percent. 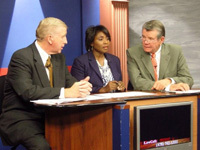 Drivers under age 21 have a “zero tolerance” for drinking and driving, but the Georgia legislature uses a standard of 0.02 grams percent or less, since an Intoxilyzer 9000 (between the two exhalations required for a valid breath alcohol test) can have a variance of up to 0.02 grams percent, between the two exhalations. 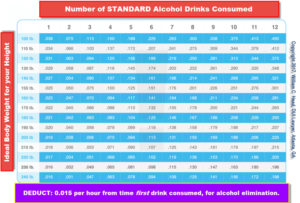 Where Can I Find an Accurate BAC Calculator? 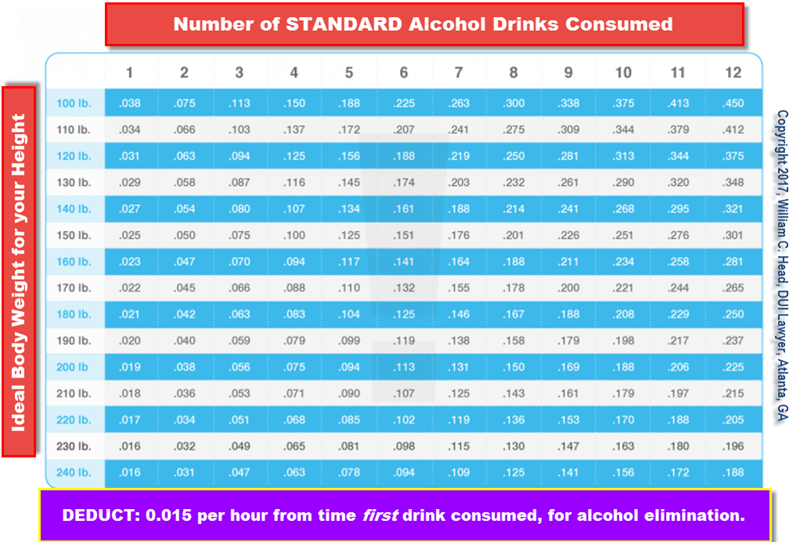 The chart set forth on this page is a fairly accurate tool to estimate BAC levels for 95% of all Americans. The chart goes to 240 pounds, but that is lean body mass. Except for Shaq and other human giants, only a small percentage of all Americans have a lean body mass beyond 240 pounds. Note that the chart below, and most others, are set for a male BAC level. Until about 25 years ago, over 81% of all DUI arrests were male drivers, but today, that split is about 70% male, and 30% female. So, for any female, assume that your BAC level on this chart would actually be about 10% or more higher than the male standard. 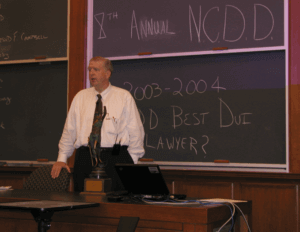 Only one DUI lawyer has ever been voted (in a national poll of drunk driving lawyers, who were members of NCDD.com) as the best DUI attorney in America. That occurred in July 2003, at Austin Hall, at the Harvard University School of Law campus in Cambridge, Massachusetts. 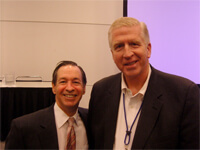 The photo above was taken by one of the attendees, just after then-Dean Gary Trichter of Texas made the announcement. The trophy awarded by the National College for DUI Defense is on the desk in front of Mr. Head, in this image. 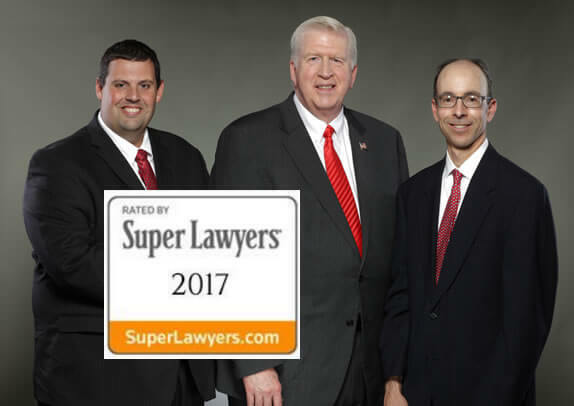 Mr. Head and both other partners at his DUI law firm are rated by Super Lawyers. Plus, Larry Kohn and Cory Yager, are both authors of chapters in a national legal book published by Aspatore Publishing, a division of Thomson-Reuters-West, the world’s largest law book publisher. Their chapters (in separate national books) are on trial strategy and litigation tips for DUI lawyers. Mr. Head published his first drunk driving book on how to beat a DUI in 1991, and has another 11 publications to his credit since then. 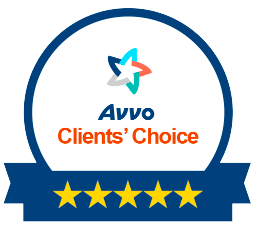 If your focus is on WINNING, call us for a FREE case review. Call our DUI specialists NOW, because we take calls 24 hours a day: 404-567-5515. The call is FREE and the initial lawyer consultation is FREE. 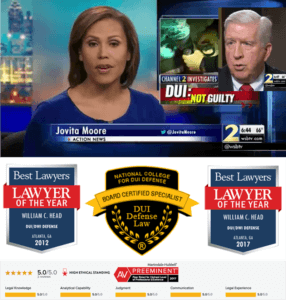 You will appreciate the difference in how our DUI attorneys approach winning a DUI in GA.